Mr. PAUL. Mr. Speaker, in the name of a truly laudable cause (preventing abortions and protecting parental rights), today the Congress could potentially move our nation one step closer to a national police state by further expanding the list of federal crimes and usurping power from the states to adequately address the issue of parental rights and family law. Of course, it is much easier to ride the current wave of criminally federalizing all human malfeasance in the name of saving the world from some evil than to uphold a Constitutional oath which prescribes a procedural structure by which the nation is protected from what is perhaps the worst evil, totalitarianism carried out by a centralized government. Who, after all, wants to be amongst those members of Congress who are portrayed as trampling parental rights or supporting the transportation of minor females across state lines for ignoble purposes. As an obstetrician of more than thirty years, I have personally delivered more than 4,000 children. During such time, I have not performed a single abortion. On the contrary, I have spoken and written extensively and publicly condemning this medical procedure. At the same time, I have remained committed to upholding the Constitutional procedural protections which leave the police power decentralized and in control of the states. In the name of protecting states rights, this bill usurps states rights by creating yet another federal crime. Our federal government is, constitutionally, a government of limited powers. Article one, Section eight, enumerates the legislative areas for which the U.S. Congress is allowed to act or enact legislation. For every other issue, the federal government lacks any authority or consent of the governed and only the state governments, their designees, or the people in their private market actions enjoy such rights to governance. The tenth amendment is brutally clear in stating The powers not delegated to the United States by the Constitution, nor prohibited by it to the States, are reserved to the States respectively, or to the people. Our nations history makes clear that the U.S. Constitution is a document intended to limit the power of central government. No serious reading of historical events surrounding the creation of the Constitution could reasonably portray it differently. Nevertheless, rather than abide by our constitutional limits, Congress today will likely pass H.R. 1218. H.R. 1218 amends title 18, United States Code, to prohibit taking minors across State lines to avoid laws requiring the involvement of parents in abortion decisions. Should parents be involved in decisions regarding the health of their children?? Absolutely. Should the law respect parents rights to not have their children taken across state lines for contemptible purposes?? Absolutely. Can a state pass an enforceable statute to prohibit taking minors across State lines to avoid laws requiring the involvement of parents in abortion decisions?? Absolutely. But when asked if there exists constitutional authority for the federal criminalizing of just such an action the answer is absolutely not. This federalizing may have the effect of nationalizing a law with criminal penalties which may be less than those desired by some states. To the extent the federal and state laws could co-exist, the necessity for a federal law is undermined and an important bill of rights protection is virtually obliterated. Concurrent jurisdiction crimes erode the right of citizens to be free of double jeopardy. The fifth amendment to the U.S. Constitution specifies that no person be subject for the same offense to be twice put in jeopardy of life or limb . . . In other words, no person shall be tried twice for the same offense. However, in United States v. Lanza, the high court in 1922 sustained a ruling that being tried by both the federal government and a state government for the same offense did not offend the doctrine of double jeopardy. One danger of the unconstitutionally expanding the federal criminal justice code is that it seriously increases the danger that one will be subject to being tried twice for the same offense. Despite the various pleas for federal correction of societal wrongs, a national police force is neither prudent nor constitutional. Most recently, we have been reminded by both Chief Justice William H. Rehnquist and former U.S. Attorney General Ed Meese that more federal crimes, while they make politicians feel good, are neither constitutionally sound nor prudent. Rehnquist stated in his year-end report The trend to federalize crimes that traditionally have been handled in state courts . . . threatens to change entirely the nature of our federal system. Meese stated that Congress tendency in recent decades to make federal crimes out of offenses that have historically been state matters has dangerous implications both for the fair administration of justice and for the principle that states are something more than mere administrative districts of a nation governed mainly from Washington. The argument which springs from the criticism of a federalized criminal code and a federal police force is that states may be less effective than a centralized federal government in dealing with those who leave one state jurisdiction for another. Fortunately, the Constitution provides for the procedural means for preserving the integrity of state sovereignty over those issues delegated to it via the tenth amendment. The privilege and immunities clause as well as full faith and credit clause allow states to exact judgments from those who violate their state laws. The Constitution even allows the federal government to legislatively preserve the procedural mechanisms which allow states to enforce their substantive laws without the federal government imposing its substantive edicts on the states. Article IV, Section 2, Clause 2 makes provision for the rendition of fugitives from one state to another. While not self-enacting, in 1783 Congress passed an act which did exactly this. There is, of course, a cost imposed upon states in working with one another rather than relying on a national, unified police force. At the same time, there is a greater cost to centralization of police power. It is important to be reminded of the benefits of federalism as well as the costs. There are sound reasons to maintain a system of smaller, independent jurisdictions. An inadequate federal law, or an adequate federal law improperly interpreted by the Supreme Court, preempts states rights to adequately address public health concerns. Roe v. Wade should serve as a sad reminder of the danger of making matters worse in all states by federalizing an issue. It is my erstwhile hope that parents will become more involved in vigilantly monitoring the activities of their own children rather than shifting parental responsibility further upon the federal government. There was a time when a popular bumper sticker read Its ten oclock; do you know where your children are? I suppose we have devolved to point where it reads Its ten oclock; does the federal government know where your children are. Further socializing and burden-shifting of the responsibilities of parenthood upon the federal government is simply not creating the proper incentive for parents to be more involved. For each of these reasons, among others, I must oppose the further and unconstitutional centralization of police powers in the national government and, accordingly, H.R. 1218. 1999 Ron Paul 69:3 Ron Paul uses similar language in 1998 Ron Paul 50:2 and 1999 Ron Paul 77:9. 1999 Ron Paul 69:3 The tenth amendment probably should be capitalized: The Tenth Amendment. 1999 Ron Paul 69:5 One danger of the unconstitutionally expanding the federal criminal justice code probably should be One danger of unconstitutionally expanding the federal criminal justice code. 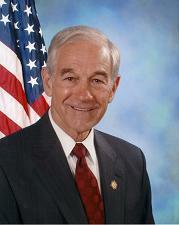 1999 Ron Paul 69:7 the tenth amendment probably should be capitalized: the Tenth Amendment. 1999 Ron Paul 69:7 The privilege and immunities clause probably should be capitalized and plural: The Privileges and Immunities Clause. 1999 Ron Paul 69:7 full faith and credit clause probably should be capitalized: Full Faith and Credit Clause.